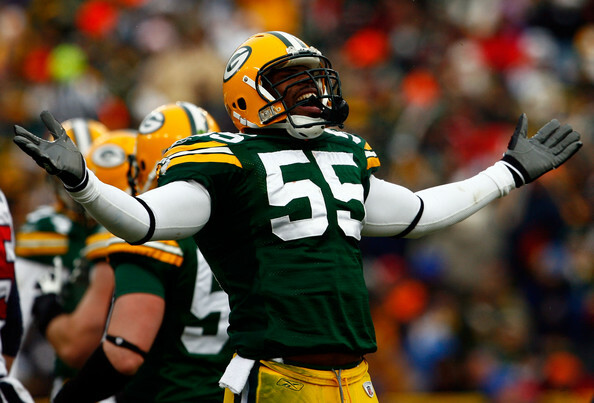 The Packers stand-out linebacker just inked a five year deal worth $65 million. The Green Bay Packers filed out of San Francisco’s Candlestick Park in stunned amazement last January. They had just been victimized by one of the most electrifying post season performances in NFL history. Colin Kaepernick’s record setting 181 yards rushing on 16 carries while throwing for another 263 yards for a combined 4 touchdowns suggested the Packers were indeed a bad defense. Aaron Rodgers and the Packers offense for the better part of 2 years masked the Packers defensive deficiencies. Yet they were exposed as needing speed in the secondary and in need of power on the defensive side of the line. This off-season, gone is Charles Woodson, the game having robbed him of his once great speed through a series of injuries. Linebacker Eric Walden took his talents to Indianapolis. Factor these departures with the medical retirement of S Nick Collins, LB Frank Zombo signing with the Chiefs this offseason, then the run defense having never recovered from DT Cullen Jenkins’ departure and you have a defense in ruin. This isn’t the team that won Super Bowl XLV in Dallas, February 2011. Now they have lost arguably their best receiver in Greg Jennings to the hated Vikings. Ted Thompson and Mark Murphy have some work ahead of them in this year’s draft to restock a defense that had been deep. The question is: Will they keep their “Midas Touch” in mining good talent for the Packers coaching staff to mold into a good defense?? Or will this side of the ball let down Green Bay when they face the NFL’s elite?? Did you know the Packers were only 1-4 against playoff teams last year?? If Rodgers continues at this pace, his career statistics could be staggering. 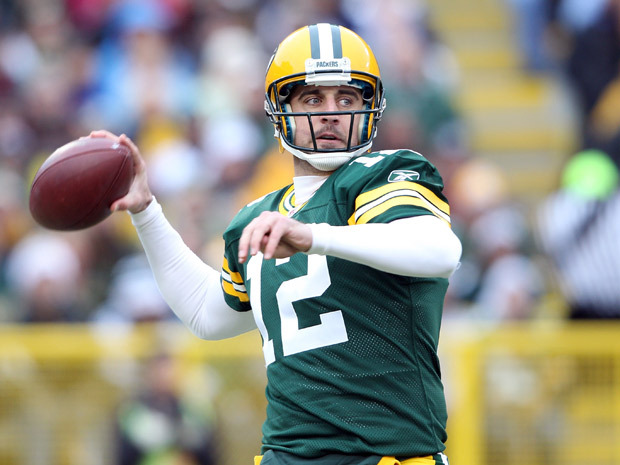 Quarterback: Suffice to say the Packers are more than sufficient behind center. Aaron Rodgers is in his prime and his last four years have been off the charts comparing him to any quarterback in football history. In contemporary times it is he and Drew Brees that have battled it out as to who is the best quarterback in the NFL. 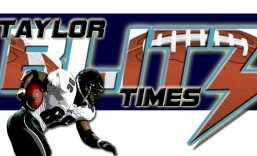 Taylor Blitz Times gives the nod to Rodgers. In the last four years he has attempted 429 less passes than Brees, yet is just behind Brees 142TDs to 156 TDs, while throwing a ton less interceptions with 32 to 66 for the man in the Bayou. By the numbers, if he threw another 429 passes he would be nearly 15 touchdowns ahead of Brees. One thing that has crept up is Rodgers has a tendency to press in close games in the second half. It happened up in Seattle in the 14-12 loss on Monday Night. We saw it in the loss to the Giants last year in the regular season, the 2011 playoff loss to the Giants and last year’s loss to the 49ers in the playoffs. He’ll miss on some throws that he has hit all year long, especially if he has been hit early in the game. One game he didn’t was the 37-34 loss in the season finale to the Minnesota Vikings. Despite being sacked 5 times, he threw for 365 yards and 4 touchdowns which included a game tying touchdown to Jordy Nelson. Yet keep an eye out for this with a team with a deficient defense and an offense minus Greg Jennings. The boys in Lambeau are Super Bowl quality at quarterback no question. Offensive Backfield: This is a spot on this team that is a mess right now. When Aaron Rodgers, who is not a running quarterback is second on the team in rushing with 259 yards, something is definitely wrong. Free agent Cedric Benson failed to pan out with only 248 yards, and a favorite during the Super Bowl stretch two years ago James Starks, rushed for only 255 yards. For us the jury is out on James Starks much as it is on Miles Austin in Dallas. When there are weapons around them… they can surprise. But when those defenses start focusing on them, they turn back into the moderate talents that they were scouted and regarded as. Could be time to cut ties here. The Packers need to draft a quality back to take some of the pressure off Rodgers. Not a sixth round steal, they need a blue chip talent. Just as we warned before about putting all your money at the quarterback position and not spending to improve other positions, the Packers are at the crossroads. They haven’t gone after any runners in free agency this year. Hopefully they realize this and make some moves this weekend in New York at the draft. This group has a bad ranking until they draft someone better. Randall Cobb brought a game breaking element to the Packers receiving corps in his second year. Receivers: We mentioned several times already that Greg Jennings departed for the lakes of Minnesota. Now James Jones will have to step up to be “that guy”. Last year he led the Packers with 14 receiving touchdowns (64 rec. for 748 yards) which was due in large part to being the third receiver in four wide formations. Is he polished enough to be a solid X in Jennings place?? At tight end, Jermichael Finley is as solid as they come and should have his best season this year. Last year he hauled in 61 receptions for 667 yards and 2 TDs despite missing two games. The coverage he drew when the Packers were close to scoring is why Jones had so many touchdowns. Jordy Nelson and Randall Cobb round out this receiving corps. These are the big play men when it comes to the passing game. Nelson was nicked by injuries and only started 10 games. He averaged 15.2 yards per catch (49 rec / 745 yds / 7 TDs) and hopes to have a year like 2011 when he reached the endzone 15 times. 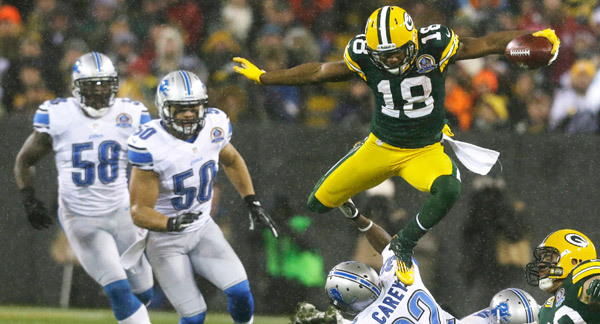 Cobb is the explosive new element to the Green Bay arsenal. He’s a threat to return a punt for a touchdown or do so after a short pass. Last year he made it on the field as a receiver and had the type of season (80 rec /954 yds/ 8 TDs) that Packers’ brass believed they could let Jennings go. This is a playoff caliber group rather than a Super Bowl group… We have to see if Jones can be as solid as Jennings was as a starter. If not they can go 4 wide and still be effective. Offensive Line: This is a spot where the Packers could use some improvement big time. If you’re going to pump $120 million dollars to retain the best quarterback in the league, you better be able to protect him. Everyone forgets that Rodgers, during the Super Bowl year, was one concussion from sitting the rest of the year by mid-season. Last year the Packers were second to last with 51 sacks allowed and he was hit an additional 85 times. He will get hit and with no proven depth behind him, his loss would doom the season if he were injured. Everyone saw the Monday night massacre in Seattle when Rodgers was sacked 8 times and chased all over Qwest Field. In 6 of the first 8 games of this season, they face top ten defenses when it came to quarterback sacks last year. Three of those they play on the road… at Cincinnati, at Baltimore with Elvis Dumervil now, and at Minnesota. They start the season in San Francisco and they can ill afford to get Rodgers hit in that game.Don’t be surprised if the Packers use a high draft pick on the offensive line. Part of their problem is they practice their passing and can’t provide a push in the running department. 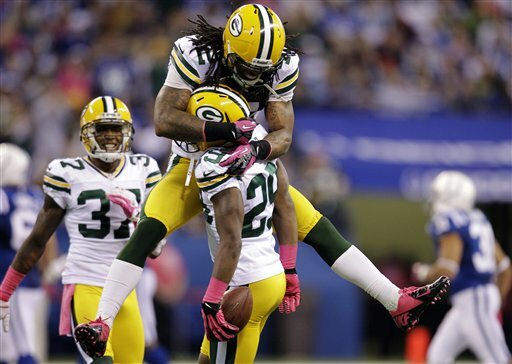 The Packers were 22nd in the NFl with less than a 4 yard average. Along with the injuries seen at the running back position, a fleet of runners started for Green Bay last year and not on of them could average 4 yard per carry. The weakness of this offensive front has been covered up by Rodgers and the receiving corps connecting on quick passes. This is a below average group and have to get tougher up front. No player has fallen from grace as far as DT BJ Raji. He was pushed around and bullied in that playoff loss to San Francisco for playing too high. He recorded 0 tackles and 0 quarterback pressures during that game. For the season he recorded 26 total tackles and 0 sacks. Terrible. Fellow inside Defensive Tackle Ryan Pickett also never recorded a sack during the 2012 season. Here is where the Packers should use a draft pick in the next four days when the draft commences on Thursday. How could they not?? We spoke of the Packers inability to stop the run since the departure from Ryan Pickett. This defensive line gets shoved right into the safeties faces. Evidence by Adrian Petersen’s nearly back to back 200 yard games against them. With no transactions during free agency we have to wait and see who they pick in the draft. If they could spend two picks here…it would be beneficial to the defense. right now this group is bad….not below average. They’re making far too many plays downfield after the ball carrier has gained 5 yards. The Packers best all around linebacker spent 2012 on injured reserve. Linebacker: Although Clay Matthews was inked to a long term deal, the best overall linebacker was Desmond Bishop that missed last season on injured reserve.. He led the team with 121 total tackles 5 sacks and 2 forced fumbles in 2011. 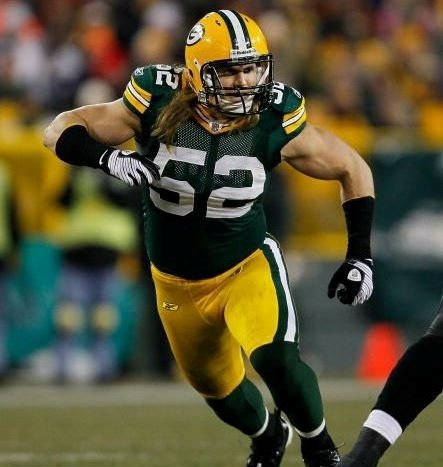 He rejoins AJ Hawk who led the 2012 Packers with 120 total tackles and 3 sacks. However Hawk is somewhat of a liability against the pass without a single pass defensed all year. He can get caught in space against speedy receivers and third down backs at times also. One question is who will Kevin Greene develop to take Walden’s place at OLB opposite Matthews?? Will they draft a new player or possibly shift present ILB Brad Jones outside or promote Dezman Moses who had 4 sacks in spot duty last season. One position that is solidified is Matthews who is one of the league’s best pass rusher. His new five year deal will keep him in Green Bay until he’s 31. Last year he had 13 sacks and is the focal point of the pass rush. This group had 34 of the team’s 52 sacks. This is a playoff caliber group that is the best part of this defense. Secondary: This group will have to develop a new leader with the loss of team captain and team favorite Charles Woodson. However they will be better at cornerback with the development of Casey Hayward (6ints) to go along with Sam Shields and Tramon Williams. Hayward led the team in interceptions and passes defensed with 21. Williams was 5th on the team with 61 total tackles and another 15 passes defensed. New FS Morgan Burnett made plenty of open field tackles with 122 but needs to make a few more plays against the pass. He should improve in his second season as a starter. Right now there are more cornerbacks than safeties in-house and may. They would be better suited to move Burnett to Strong Safety and drafting a more natural ball hawk. Not trying to keep a fading Woodson in the lineup, this secondary could be even better and should be a playoff caliber group. Hayward’s development gives the Packers three quality young corners. Overview: Now someone may read that and ask if The Chancellor felt they needed to improve on back seven yet gave the a playoff caliber grade. The Packers do pressure opposing quarterbacks yet have to blitz to do it. This includes the secondary who contributed with 5.5 sacks themselves. Yet this feast or famine leaves players in coverage too long or provide a Colin Kapernick immense running lanes. The Packers have been quiet this off-season keeping the team intact and trusting their ability to draft. Over the last few years Green Bay has been able to stock the roster with quality talent. Can they stay ahead of their NFC North counterparts?? This draft will tell the tale. However they have come down from their perch as an NFC heavyweight and looks like they will battle it out just to be a wild card in 2013. Aaron Rodgers and the passing game can cover only so many deficiencies. This entry was posted in 2013 Team Previews and tagged 2013 Green Bay Packers preview, Aaron Rodgers, Clay Matthews III, Eddie Lacy, football, Green Bay Packers, nfl football, NFL Players, NFL Previews, sports. Bookmark the permalink. These aren’t going to be the same ole Pack! Agree that James Jones needs to bring his A game without #85 in the WR mix. Boy they do seem to have a lot of holes. Rodgers is a miracle worker and anything that makes his job easier seems the way to go. To me that means O line.